Dendritic cells (DC) are potent APCs that sample Ags from the surrounding environment and present them to naive T cells using cell surface Ag-presenting molecules. The DC in both lymphoid and nonlymphoid tissues express high levels of CD1, a cell surface glycoprotein capable of presenting lipids and glycolipids to T cells. Distinct group 1 CD1 isoforms (CD1a, -b, -c) in man are known to traffic to different parts of the endocytic system where microbial Ags may be sampled. Guinea pigs are the only known rodent species that express the group 1 CD1 proteins. Therefore, we examined the expression and trafficking of guinea pig CD1 (gpCD1) isoforms on isolated DC. Confocal microscopy using mAbs specific for individual gpCD1 isoforms revealed differential trafficking of two distinct CD1b isoforms within DC. Colocalization of MHC class II was observed with the gpCD1b1 isoform, consistent with localization in the late endosomes of DC. In contrast, the gpCD1b3 isoform lacks an endosomal sorting motif and remains on the cell surface. 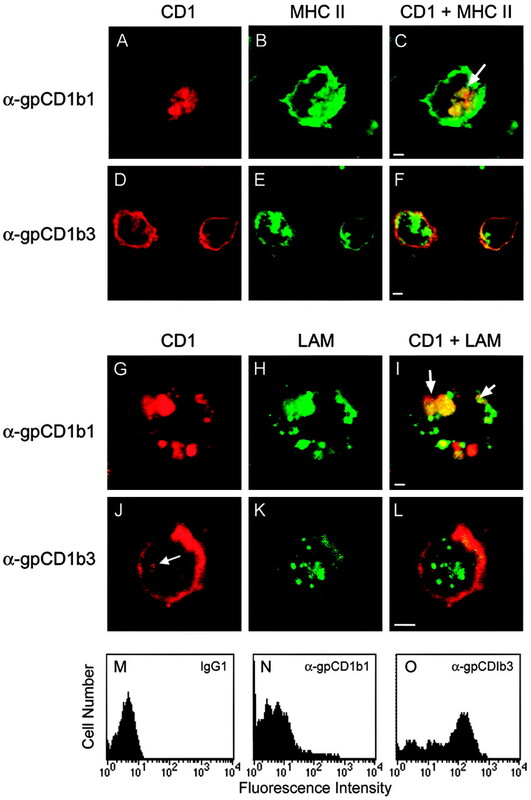 Following incubation with Mycobacterium tuberculosis lipoarabinomannan, colocalization of endocytosed lipoarabinomannan with the gpCD1b1 isoform was observed but not with the gpCD1b3 isoform, which remained primarily on the cell surface. These data demonstrate that guinea pig DC express CD1 isoforms with unique trafficking patterns that recapitulate the patterns seen for human CD1 isoforms. This suggests evolutionary pressure for a conserved mechanism in mammals that allows CD1 to sample lipid Ags from various subcompartments of the endocytic system. Dendritic cells (DC)3 are the most potent APCs known to possess the necessary cellular machinery to sample foreign Ags from the extracellular environment and to then process and present these Ags to naive T cells. DC initiate the first steps in what is classically defined as the adaptive immune response. Critical to this function is the binding of foreign Ags to an Ag-presenting molecule and expression of this complex on the surface of the DC for recognition by T cells. As professional APCs, the DC express several Ag-presenting molecules for this purpose including MHC class I, MHC class II, and CD1. The human CD1 gene family is a nonpolymorphic gene cluster located on chromosome 1, unlinked to the MHC locus on chromosome 6 (1). The CD1 gene family consists of five isoforms designated CD1A, -B, -C, -D, and -E. These are divided into two groups based on protein sequence homology, with group 1 consisting of the CD1a, -b, and -c isoforms and the group 2 consisting of only the CD1d isoform (2, 3). Unlike the MHC, which presents peptides to T cells, CD1 has evolved the unique capacity to present lipids and glycolipids derived from microbes to Ag-specific T cells. These T cells have potentially important effector functions for control of infections, including release of bactericidal factors, secretion of IFN-γ, and cytolytic functions (4, 5). Interestingly, all of the Mycobacterium tuberculosis lipid reactive T cells are restricted to one of the group 1 CD1 isoforms while no CD1d-restricted T cells specific for bacterial lipids have been described. These data suggest an important role for the group 1 CD1 proteins in the immune response to infection. In humans, CD1 proteins are expressed on DC in both lymphoid and nonlymphoid tissues including lymph nodes, Langerhans cells in the epidermis, and dermal DC (3). CD1 is also up-regulated following cytokine-mediated maturation of peripheral blood monocytes into immature DC. These APC are capable of stimulating CD1-restricted T cells specific for bacterial lipid Ags in vitro. Examples of CD1-restricted human T cell lines have been found for all of the major T cell phenotypes including CD4+/TCRαβ+, CD8+/TCRαβ+, CD4−CD8−/TCRαβ+, and TCRγδ+ (4, 6, 7, 8, 9). In addition, patients recently infected with M. tuberculosis have significant CD1-restricted T cell proliferative responses to a lipid Ag compared with uninfected controls (10). However, the in vivo significance of these T cell responses remains unknown. Previously, we have described an extended group 1 CD1 gene family in guinea pigs. The guinea pig CD1 (gpCD1) gene family has expanded to include four homologs of CD1b (gpCD1B1, -B2, -B3, and -B4) and three of CD1c (gpCD1C1, -C2, and -C3) and a single CD1E gene (gpCD1E) (11, 12). In addition, we have recently demonstrated that immunization of guinea pigs with lipid Ags is capable of eliciting CD1-restricted T cell responses (13). It is not possible to study group 1 CD1-restricted T cells in mice and rats as these species have only CD1d (group2) homologs (14). Therefore, we have been developing the guinea pig as a small animal model to assess the functional role of group 1 CD1 Ag presentation in vivo. In this study, we describe the expression of group 1 CD1 isoforms in tissue DC and on purified DC isolated from guinea pig spleen. Purification of DC from spleen was facilitated by treatment of guinea pigs with a murine fms-like tyrosine kinase 3 (Flt-3) ligand mouse IgG2a Fc fusion protein (Flt-3LFc). In addition, we show that two different gpCD1b isoforms traffic to distinct endosomal compartments within DC. These findings have important implications for the potential role of the different CD1 isoforms in Ag presentation. Hartley strain guinea pigs were obtained from Elm Hill Breeders (Chelmsford, MA). Strain 2 guinea pigs were bred in-house. Guinea pigs were housed under specific pathogen-free conditions at the Dana-Farber Cancer Institute animal facility. BALB/c mice were purchased from Taconic Farms (Germantown, NY). Mice were housed and maintained in the animal facility of Brigham and Women’s Hospital (Boston, MA) under virus Ab-free conditions. All animals were treated and maintained in accordance with institutional standards. The cDNA coding sequence for the secreted form of murine Flt-3L was amplified by PCR from a murine T cell cDNA using standard techniques (15). The 5′ primer (5′-aaaagaattccatgaggggtccccggcaga-3′) and 3′ primer (5′-cggggtaccgtggatccttctgcctgggccgaggctctgggag-3′) were used to generate a product containing the nucleotides encoding the secreted domains of the murine Flt-3L. A plasmid construct containing the nonlytic Fc coding sequence of the murine IgG2a was kindly provided by X. Xiao Zheng (Beth Israel Deaconess Medical Center, Boston, MA) (16). The IgG2a Fc coding sequence was previously engineered to eliminate the binding of the Fc region to cell surface FcR (16). A second mutation in the Fc domain also abrogates complement binding to the fusion protein (16). A DNA fragment containing the coding sequences for the nonlytic Fc coding region was isolated using restriction enzyme digestion with BamHI and XbaI. The amplified Flt-3L PCR product was then digested with restriction enzymes EcoRI and BamHI to generate compatible cohesive ends ligated to the coding sequence of the murine nonlytic Fc and inserted into pCI-neo (Promega, Madison, WI) to create a construct with the murine Flt-3L coding sequences at the 5′ and the nonlytic murine IgG2a Fc domain coding sequences at the 3′ end. This construct was transfected into CHO cells using Superfect reagent (Qiagen, Valencia, CA) according to the manufacturer’s instructions. Cells were subjected to selection with G418 (Invitrogen, Carlsbad, CA) and cloned by limiting dilution. A clone secreting high levels of the fusion protein was detected by an ELISA screening assay. Briefly, plates were coated with anti-mouse IgG, A, and M (Zymed Laboratories, San Francisco, CA) in PBS followed by blocking with 1% BSA in PBS. After incubating the supernatants in the wells for 1 h, the fusion protein was detected with a biotinylated anti-mouse Flt-3L Ab (R&D Systems, Minneapolis, MN), followed by incubations with alkaline phosphatase-conjugated streptavidin and paranitrophenyl phosphate. A single clone was expanded to 10 L in a stirred vessel and the fusion protein was purified using protein A Sepharose affinity chromatography. The endotoxin content of the purified Flt-3LFc protein was <1 EU/ml as assessed by Pyrotell assay (Associates of Cape Cod, Falmouth, MA). Biochemical analysis of the fusion protein was conducted by PAGE. Purified Flt-3LFc protein was electrophoresed on a 12% acrylamide gel and stained with Coomassie brilliant blue or analyzed by Western blotting (17). For Western blotting, the fusion protein was detected using an anti-Flt-3L anti-serum (R&D Systems). The bands were visualized using HRP-conjugated donkey anti-mouse IgG (Jackson ImmunoResearch Laboratories, West Grove, PA) and Renaissance chemiluminescence reagent (NEN, Boston, MA). BALB/c mice were given daily i.p. injections with either PBS alone or 10 μg of Flt-3Fc fusion protein in PBS for 9 days. On day 10, mice were sacrificed and their spleens were removed. After RBC lysis, spleen cells were directly stained with Abs. To determine the expression of various cell surface markers, 1 × 106 cells were suspended in anti-FcR Ab 2.4G2 (American Type Culture Collection (ATCC), Rockville, MD) supernatant to block nonspecific Ab binding. Abs to various cell surface markers were added at the appropriate dilution and the cells were incubated for 20 min on ice in the dark. Cells were washed twice with FACS buffer (PBS with 2% FCS) and then resuspended in 2% paraformaldehyde for analysis. Flow cytometry was performed using a FACSCalibur cytometer (BD Biosciences, San Jose, CA) with CellQuest 3.0 software for acquisition and analysis. The following Abs were used for flow cytometry analysis: control hamster IgG (A19-4), control rat IgG2b (A95-1), αCD11c (HL3), and αCD11b (M1/70). All of these Abs were directly conjugated with FITC or PE and were obtained from BD PharMingen (San Diego, CA). Guinea pigs were injected i.p. daily with 0.1 mg purified Flt-3LFc protein in 3 ml PBS for 9 days. No adverse reactions to the treatment were observed. Animals were euthanized on day 10 by sodium pentobarbital overdose. Spleen and other tissues were removed under sterile conditions. DC were obtained from the spleens using published techniques (18). Briefly, spleens were injected with 20 ml of DMEM media (Invitrogen) containing 100 U/ml collagenase type IV (Worthington Biochemical, Lakewood, NJ) and incubated at 37°C for 15 min. The spleens were then transferred to 400 U/ml collagenase and mechanically disrupted, followed by repeated pipetting until a single-cell suspension was generated. The resulting suspension was centrifuged and the pellet resuspended in ACK for 2 min to lyse RBC and then washed with RPMI. The resulting splenocyte pellet was resuspended in 20 ml BSA solution (1.080 g/ml) and 5 ml added to 15-ml conical tubes and overlaid with RPMI. Gradients were centrifuged 3000 rpm in a Sorvall RT-7 centrifuge for 30 min at 4°C. The floating cells were then removed from the top of the gradients and washed with RPMI. Cells were then allowed to adhere to plastic petri dishes for 90 min followed by removal of nonadherent cells. Adherent cells were then incubated for 18 h in RPMI medium. Enriched DC were then harvested and used for analysis. The mAbs used for guinea pigs in these studies include BCD1b3.1 (specific for human CD1b and cross-reactive with the gpCD1b2, -b4, and -c3 isoforms) that has been described previously (11, 12, 19); P3 was used as the nonspecific mouse IgG1 isotype control Ab (20); 1D12.1 is specific for gpCD1b1 (11); 6B5 is a guinea pig pan-CD1 mAb (11); MSgp9 (Serotec, Raleigh, NC) is a pan B cell Ab specific for gpCD1b3 (11, 21). IVA12 (ATCC) is a pan-human MHC class II specific Ab that cross-reacts with guinea pig MHC class II. FACS analysis was performed as previously described (22). Briefly, primary Abs were added to single-cell suspensions at saturating concentrations for 1 h, washed with staining buffer (PBS containing 2% FCS and 0.01% azide), and then incubated for 1 h with 30 μg/ml FITC-conjugated donkey anti-mouse IgG (Jackson ImmunoResearch Laboratories). After staining, cells were washed and analyzed with a FACSort flow cytometer (BD Biosciences). The forward and side scatter profiles of the analyzed cells were used to gate on the monocyte subpopulation. Dead cells were excluded using propidium iodide (Sigma-Aldrich, St. Louis, MO). Samples of all tissues were fixed in 10% buffered formalin for at least 24 h. Following this, fixed tissues were embedded in paraffin, sectioned at 5 μm, and stained with H&E using standard techniques. Unfixed tissue samples used for immunohistochemistry were mounted in OCT compound (Tissue-Tek, Torrance, CA), frozen in liquid nitrogen and stored at −80°C. Single-cell suspensions of enriched DC were cytospun onto glass slides. Cytospun cells and frozen tissue sections (5 μm) were fixed in acetone for 10 min, air dried, and stained with a primary Ab as indicated and detected by an indirect immunoperoxidase method using avidin-biotin-peroxidase complex (Vector Laboratories, Burlingame, CA) and 3-amino-9-ethylcarbazole (Sigma-Aldrich) as the chromogen. Some cytospun DC preparations were stained with Diff-Quik according to the manufacturer’s instructions (Fischer Scientific, Pittsburgh, PA). Double labeling was performed as described previously (23). Briefly, isolated guinea pig DC were adhered to glass coverslips by cytospin followed by staining with mAb to either gpCD1b1 or gpCD1b3 isoforms and MHC class II. The CD1 Abs were detected with Texas Red-conjugated donkey F(ab′)2 Ab to mouse IgG (Jackson ImmunoResearch Laboratories). The IVA12 Ab (anti-MHC class II) was directly conjugated with Alexa-488 (Molecular Probes, Eugene, OR). For Ag-pulsed cells, guinea pig DCs were incubated for 4 h with purified M. tuberculosis lipoarabinomannan (LAM) (20 μg/ml; kindly supplied by J. Belisle, Colorado State University, Fort Collins, CO). At the end of the culture, the LAM-pulsed cells were washed and adhered on glass slides by cytospin. The cells were then fixed and permeabilized, and double-labeled with mouse mAbs to the specified gpCD1 isoforms and a rabbit polyclonal Ab specific for mycobacterial LAM. The CD1 Abs were detected as described above. The rabbit anti-LAM was detected with FITC-conjugated donkey (Fab′2) Ab to rabbit IgG (Jackson ImmunoResearch Laboratories). The labeled cells were examined using a Leica TCS-NT confocal laser scanning microscope fitted with krypton and argon lasers as described previously (23). Purified guinea pig DC were resuspended in RPMI medium and placed onto poly-l-lysine-treated glass coverslips for 30 min at 37°C. Cells were then fixed with 5% glutaraldehyde/2.5% paraformaldehyde/0.06% picric acid in 0.1 M cacodylate buffer (pH 7.4) for 1 h at room temperature. Fixed cells were then treated with 1% osmium tetroxide for 1 h at room temperature. Following dehydration cells were critical point dried, mounted, and sputter-coated with palladium. Specimens were examined using a JEOL JSM-5600LV scanning electron microscope (JEOL, Peabody, MA). The M. tuberculosis H37Rv strain expressing green fluorescent protein (GFP) was a generous gift from Dr. J. Ernst (24). Bacteria were cultured in Middlebrook 7H9 medium supplemented with albumin/dextrose/catalase to midlog growth. Bacteria were then washed once in tissue RPMI medium containing 10% FCS, filtered through a 5 μm filter, counted, and added to wells containing gpDC growing on glass coverslips at an multiplicity of infection of ∼5:1. Cells were then incubated at 37°C/5% CO2 for 4 h. Cells were then fixed with 2% paraformaldehyde and stained with Alexa-594 (Molecular Probes) conjugated 6B5 mAb. Stained cells were then visualized using a Nikon Eclipse 800 microscope (Nikon, Melville, NY). Strain 2 guinea pigs were treated with Flt-3LFc or PBS as a vehicle control and DC were isolated as described above. A single-cell suspension of whole strain 2 guinea pig splenocytes was also generated. Nylon wool nonadherent T cells were isolated from the spleen of a Hartley strain guinea pig and used as responder cells for the assay. A single-cell suspension from whole spleen of the same Hartley guinea pig was used to generate autologous stimulators. The purified DC and autologous stimulators were gamma-irradiated with a dose of 5000 rad. Stimulators were plated in 96-well plates starting at 2 × 105/well and titered out 2-fold. The Hartley responder T cells were plated at 2 × 105/well. Cells were incubated for 5 days at 37°C/5% CO2, pulsed with [3H]-thymidine (1 μCi/well), harvested, and counted. We have previously described the expression of group 1 CD1 proteins on cells in lymphoid and nonlymphoid tissues of guinea pigs (11, 12). Of particular interest is the expression of CD1 on DC in lymphoid tissues since these are critical cells for presenting Ags to T cells. Tissue sections of lymph nodes from naive guinea pigs were stained with Ab 6B5 (pan gpCD1) and detected by an immunoperoxidase technique. Fig. 1⇓A shows a large proportion of B cells in the secondary lymphoid follicles that are positive for CD1 as we have described previously (11, 12). In addition, a small but distinct population of CD1-positive cells was detected in the paracortical regions of the nodes which are predominantly the T cell areas (Fig. 1⇓A, arrows). Higher magnification revealed that these cells exhibited a dendritic morphology with interdigitating processes that project into the surrounding tissue (Fig. 1⇓, B and C). The location and pattern of staining in lymph nodes is consistent with a guinea pig DC population and is similar to that seen in other species. Because of the potential importance of DC in priming CD1-restricted T cells, we characterized this cell population in greater detail. Expression of CD1 on cells in the guinea pig lymph node. A, CD1 staining (red) of sporadic cells with dendritic morphology (arrows) in the paracortical (PC) regions of the lymph node of guinea pigs. Note the large secondary lymphoid follicle with many CD1+ B cells with a weakly staining germinal center (GC). Closeup of CD1 stained DC in the lymph node PC demonstrating interdigitating processes (arrows) emanating from the cell body (B and C). This region of the lymph node is dominated by T cells. Tissue was stained with BCD1b3.1 Ab, visualized with an anti-mouse avidin-biotin-peroxidase complex and counterstained with hematoxylin. Magnifications are ×100 (A), ×400 (B), and ×600 (C). DC represent a rare subpopulation of bone marrow-derived cells within lymphoid organs, including the spleen and lymph nodes. Typical yields from mouse spleen are <1 million cells. This makes isolation of pure DC in sufficient numbers for in vitro analysis technically difficult. To overcome this problem, we generated a recombinant Flt-3L fusion protein which has been shown previously to significantly increase the number of DC in vivo (25). The murine Flt-3L cDNA coding for the secreted form of the protein was inserted upstream of a modified murine IgG2a Fc domain coding sequence. Supernatant from a cell line transfected with the plasmid was used to purify Flt-3LFc protein using protein A affinity chromatography. A sample of purified protein was analyzed by PAGE and Western blot to confirm the molecular mass and identity of the purified material. The molecular mass of the purified protein is ∼66 kDa which is consistent with an intact glycosylated fusion protein (Fig. 2⇓A, lane 1). A Western blot using antiserum to Flt-3L was performed to confirm the immunoreactivity of the Flt-3L portion of the fusion construct. A major immunoreactive species was visualized at the same molecular mass as that of the Coomassie stained gel (Fig. 2⇓A, lane 2). We then confirmed the bioactivity of the purified Flt-3LFc protein in mice since the murine Flt-3L coding sequences were used in the construct. Whole splenocyte suspensions from Flt-3LFc protein-treated mice were subjected to FACS analysis (Fig. 2⇓B). A clear increase in the percentage of CD11c+ cells was observed (2.2–17.8%) following Flt-3LFc treatment. These data indicate that the recombinant Flt-3LFc protein had in vivo bioactivity and that it increased the splenic DC population consistent with previously described activity. Purification of murine Flt3L fusion protein and functional activity in mice. A total of 10 μg of purified murine Flt-3LFc fusion protein was analyzed by PAGE and stained with Coomassie blue (A, lane 1). A parallel lane was subjected to Western blot using anti-Flt3L antiserum (A, lane 2). The molecular mass of the protein band corresponds to the predicted mass of the murine IgG2a Fc-Flt3L fusion protein. DC from mice injected with Flt-3LFc (B, bottom panels) or PBS vehicle control (B, top panels) were analyzed two-color by flow cytometry. The Abs used were A19-4 (hamster IgG), A95-1 (control rat IgG2b), HL3 α(CD11c), and M1/70 (αCD11b). A significant increase in CD11c-positive cell population is seen in the mice treated with Flt3L (17.8%) as compared with PBS-treated mice (2.2%). We next tested the murine Flt-3LFc fusion protein in guinea pigs in an attempt to quantitatively increase the DC population in lymphoid tissues, thereby facilitating their isolation and further analysis in vitro. Because Flt-3L is highly conserved and functionally cross-reacts among several mammal species, we reasoned that murine Flt-3L would also be bioactive in the guinea pig (26). Guinea pigs were treated with Flt-3LFc as described in Materials and Methods. Gross examination of the spleen (Fig. 3⇓A) and lymph nodes (Fig. 3⇓B) during necropsy revealed significant increases in size and mass of the Flt-3LFc-treated guinea pig tissues when compared with vehicle-injected control animals. Histological examination of the inguinal lymph nodes taken from vehicle- and Flt-3LFc-treated animals showed extensive infiltration of nonlymphocytic mononuclear cells throughout the cortex of the Flt-3LFc-treated animals only (Fig. 3⇓, D and F). In contrast, PBS-treated animals had normal appearing nodes with lymphocytes predominating (Fig. 3⇓, C and E). Histological examination of the spleens also demonstrated extensive infiltration of nonlymphocytic mononuclear cells (data not shown). In addition, both the lung and liver had perivascular infiltrates (data not shown). Histology of murine Flt-3LFc-treated guinea pig tissue. Guinea pigs were treated for 9 days with either Flt-3LFc or PBS vehicle control. A, Gross pathology with significant enlargement of the spleen in Flt-3LFc-treated animals compared with PBS-treated guinea pig. The total spleen mass is approximately twice that of a normal animal. B, H&E-stained cross sections of inguinal lymph nodes from PBS and Flt-3LFc-treated guinea pigs. Significant enlargement is seen in the node following Flt-3LFc treatment. Low and high power bright field microscopy of H&E-stained lymph nodes were examined to characterize the cellular infiltration (C–F). Lymph nodes from PBS-treated guinea pigs show normal architecture and predominantly lymphocytes (C and E). 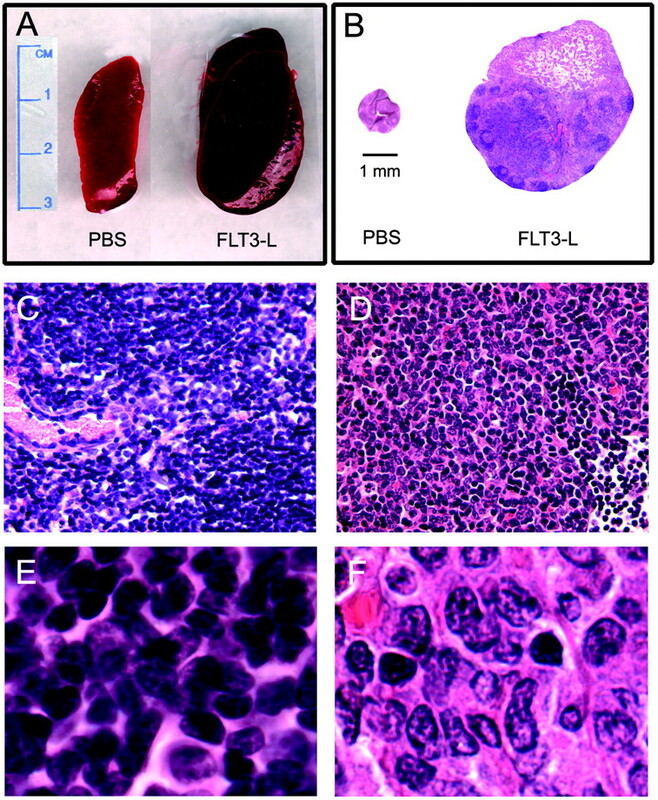 In contrast, lymph nodes from Flt-3LFc-treated animals are enlarged with massive infiltration of monocytoid cells exhibiting fainter nuclear staining and enlarged cytoplasm (D and F). Magnifications are ×200 (C and D) and ×600 (E and F). To further characterize the infiltrating cells observed in lymphoid tissues, we isolated DC from the Flt-3LFc-treated guinea pig spleens as described in Materials and Methods. Following isolation and overnight incubation, purified DC became detached from the plastic surface and were then harvested for further analysis. The cell yields from guinea pigs treated with Flt-3LFc were ∼5-fold greater than animals treated with PBS (vehicle). Typical cell yields from Flt-3LFc-treated guinea pigs were 5–6 × 106 cells compared with <1 million for a negative control (PBS-injected) animal. Phase contrast microscopy of the cultured nonadherent cell population showed numerous cells with thin processes and folds emanating from the cell surface, consistent with a DC phenotype (data not shown). This enriched guinea pig splenic DC preparation was characterized further. Scanning electron microscopy was used to visualize the cellular ultrastructure of isolated guinea pig DC (Fig. 4⇓, A and B). Numerous cells with prominent dendritic processes and cell surface folds were present in these preparations. 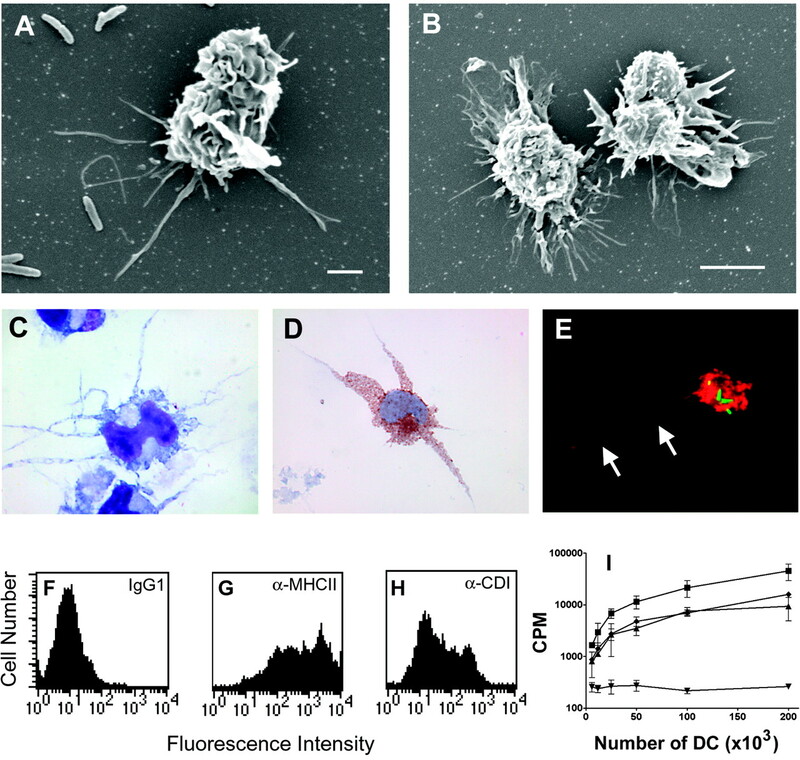 A cytospin preparation of the DC stained with Diff-Quik revealed many cells with long cytoplasmic extensions emanating from the cell body consistent with the dendritic morphology observed in situ (Figs. 1⇑C and 4, A–C). The length of the projections relative to the size of the cell body is consistent with DCs as opposed to macrophages (D. Friend, unpublished observations). In addition, the nucleus of DC often have indentations and an irregular morphology which is also evident here (Fig. 4⇓, C and D). Cytospin preparations were stained with Abs specific for gpCD1 and visualized by immunoperoxidase technique. Numerous cells exhibiting dendritic morphology were stained with the 6B5 Ab demonstrating that CD1 is highly expressed on this population of splenic DC elicited by Flt-3LFc fusion protein (Fig. 4⇓D). Using this technique, we estimated the purity of the cell preparations from Flt-3L-treated guinea pigs to be ∼70% DC while the vehicle-treated animals were ∼30% DC or less. The remaining contaminating cells were likely to be T cells based on FACS (data not shown). Morphological and functional characterization of guinea pig DC. A and B, Scanning electron microscopy of purified DC from guinea pigs. Note the M. tuberculosis bacteria at the left in A for size comparison. Bars are 2 μm (A) and 5 μm (B). C, A cytospin preparation of purified DC stained with Diff-Quik demonstrating cell surface projections, ×600. D, A cytospin of purified DC stained with the pan gpCD1 Ab 6B5 and visualized with an anti-mouse avidin-biotin-peroxidase complex. Positive staining is red with hematoxylin counterstain. E, Phagocytosis of live GFP-expressing M. tuberculosis bacteria (green) by cultured guinea pig DC that were counterstained with Alexa-594-conjugated 6B5 Ab (red). Note the long projection (white arrows) on the left emanating from the cell body. F, The IgG1 isotype control Ab (P3) used in flow cytometry of purified guinea pig DC. G, High levels of MHC class II (IVA12) expression by DC. H, CD1 (6B5) expression on purified DC. Note the biphasic population of cells. I, Demonstration that DC from Flt-3LFc-treated strain 2 guinea pigs are able to support an MLR using allogeneic responder cells (2 × 105) from a Hartley strain guinea pig. The magnitude of the response is larger using DC from Flt-3LFc-treated animals compared with DC from a vehicle control-treated animal or whole splenocytes. ▪ are DC from a Flt-3LFc-treated strain 2 guinea pig; ▴ are DC from PBS-treated strain 2 guinea pig; ♦ are strain 2 guinea pig whole splenocytes; ▾ are autologous splenocytes from the responder Hartley strain guinea pig. The x-axis of the graph reflects the total number of cells added to the well from each preparation. The actual DC in each well is dependent upon the purity of the preparation. The Flt-3L-treated guinea pig splenic preparation was ∼72% DC, while the PBS-treated animal was ∼31% DC. Phenotypic analysis of purified guinea pig DC was conducted using flow cytometry and Abs specific for cell surface markers typically present on DC. The MHC class II protein is highly expressed on the purified DC preparations (Fig. 4⇑G). The CD1 protein is also expressed on purified DC (Fig. 4⇑H). Among these cells, there appears to be two subpopulations with a medium or high expression of MHC class II and CD1 possibly reflecting the maturation state of the cells. These data correlate with the CD1 Ab staining of the cytospins and are consistent with the known expression of MHC and CD1 Ag-presenting molecules on DC from both human and mouse (27). A functional hallmark of immature DCs is that they are highly phagocytic, which facilitates their role as APCs. We tested the phagocytic capacity of purified guinea pig DC in vitro using GFP-expressing M. tuberculosis bacteria. Purified DC were pulsed with viable bacteria, fixed, and then stained with anti-CD1 Ab. Microscopic examination revealed numerous bacteria associated with CD1-positive cells confirming the phagocytic capacity of the purified DC (Fig. 4⇑E). Another distinguishing feature of DC is their capacity to stimulate an MLR. We used DC isolated from Flt-3LFc- or vehicle-treated strain 2 guinea pigs (inbred) as stimulatory target cells. Purified T cells from a Hartley strain (outbred) guinea pig were used as responders (Fig. 4⇑I). These data show a more potent activating potential of the Flt-3LFc-derived DC compared with cells isolated from PBS-treated animals or whole splenocytes. Although equal cell numbers were used in the assay, the reduced yield of DC from the vehicle-treated control animal results in a lower percentage of DC (∼30%) in the cell preparation. This may account for the reduced proliferation by allogeneic responders. Thus, the murine Flt-3LFc fusion protein induces the expansion of a splenic cell population that have both the morphological and functional characteristics consistent with DC expansion. Previous studies of human CD1 proteins have demonstrated differential trafficking within the endosomal system of the CD1a, -b, and -c isoforms (23, 28, 29). This has been postulated to facilitate lipid Ag sampling from different subcellular compartments of the endocytic system. Inspection of the C-terminal residues of the gpCD1 proteins revealed that all of the group 1 CD1 isoforms possess putative tyrosine-based endosomal sorting motifs with the exception of the gpCD1b3 isoform (12). Based on this observation, we predicted that the gpCD1b3 protein would traffic in a pattern distinct from the other gpCD1 isoforms, possibly similar to human CD1a, the only human CD1 isoform that lacks the cytoplasmic tyrosine-based motif and which localizes mainly in early endosomes and on the cell surface. This observation was confirmed using a gpCD1b3 transfectant cell line (11). In contrast, we predicted that the remaining gpCD1 isoforms would traffic to the lysosomal compartment, similar to human CD1b and CD1c isoforms that contain a similar tyrosine-based sorting motif (30). Therefore, we characterized the differential trafficking of the CD1 isoforms expressed in guinea pig DC to examine this phenomenon in freshly isolated cells that naturally express these proteins. The trafficking of distinct gpCD1b isoforms was compared in DC to characterize the differential trafficking of two closely related CD1 isoforms. We first identified two mAbs, 1D12.4 and MSgp9, that recognize the gpCD1b1 and gpCD1b3 isoforms, respectively, and do not cross-react with other gpCD1 isoforms (11). Isolated and permeabilized splenic DC from Flt-3LFc-treated animals were stained with Abs to either gpCD1b1 or gpCD1b3 (Fig. 5⇓, A and D) to localize the compartmental expression of the isoforms. Cells were colabeled with Ab to MHC class II which is expressed both on the cell surface and in late endosomes/lysosomes (Fig. 5⇓, B and E). Double labeling of the DC for gpCD1b1 and MHC class II revealed colocalization of CD1 and MHC class II (Fig. 5⇓C, arrow). These data are consistent with gpCD1b1 localization in the late endosome or lysosome compartment. This same labeling procedure was also conducted using the MSgp9 Ab specific for gpCD1b3 that lacks the tyrosine-based sorting motif (Fig. 5⇓, D–F). Most of the staining for gpCD1b3 is on the cell surface with a small but distinct punctate staining present inside the cell (Fig. 5⇓D). As predicted, the gpCD1b3 protein does not colocalize with the MHC class II inside the cell but rather remains primarily on the cell surface (Fig. 5⇓F). Analysis of the DC preparations by FACS gave similar results with the gpCD1b1 isoform staining weakly on the cell surface (Fig. 5⇓N) while gpCD1b3 isoform showed greater surface staining (Fig. 5⇓O). These data indicate that the gpCD1b1 and gpCD1b3 isoforms have distinct patterns of expression in DC that may allow sampling of different endosomal compartments, and mirror the differential localization of human CD1b and CD1a isoforms, respectively. Differential localization of CD1b isoforms in guinea pig DC using confocal microscopy. Purified guinea pig DC were double-labeled with IVA12 Ab to MHC class II (B and E) and either Ab 1D12.1 specific for gpCD1b1 (A) or Ab Msgp9 specific for gpCD1b3 (D). The gpCD1b1 protein colocalizes (white arrow; yellow) in intracellular compartments with MHC class II (C). Staining DC with Ab to gpCD1b3 (D) shows cell surface staining and colocalization of CD1 with MHC class II present on the cell surface (F). Purified DC were pulsed with M. tuberculosis LAM for 4 h (G–L). Cells were then double-labeled with either Ab 1D12.1 specific for gpCD1b1 (G) or Ab Msgp9 specific for gpCD1b3 (J) and with rabbit antiserum specific for LAM Ag (H and K). Colocalization (white arrows; yellow) of the gpCD1b1 isoform with LAM in some intracellular vesicles is present (I). In contrast, the gpCD1b3 isoform remains surface localized with some small intracellular staining (J, arrow) and does not colocalize with LAM containing vesicles (L). All bars are 2 μm except J–L which are 5 μm. FACS analysis of DC preparations was conducted in parallel. M, The IgG1 isotype control Ab (P3) used in flow cytometry of purified guinea pig DC. N, Staining with Ab 1D12 specific for the gpCD1b1 isoform. O, Staining of DC with Ab MsGP9 specific for the gpCD1b3 isoform. It is well-established that the CD1 proteins have the capacity to present lipid Ags derived from M. tuberculosis to T cells. Therefore, we investigated whether a known CD1 lipid Ag was capable of trafficking to the same intracellular compartment as the CD1 in the guinea pig DC. The DC derived from the guinea pig spleens were pulsed with LAM derived from M. tuberculosis and then double-labeled to detect LAM Ag and CD1 protein. The LAM Ag appeared in punctate vesicles within the cell and exhibited colocalization with the gpCD1b1 protein (Fig. 5⇑I, arrows). These data support the presence of CD1 in lysosomes together with a mycobacterial glycolipid Ag known to be presented by human CD1b (31). Conversely, when we stained for gpCD1b3 and LAM, there was little or no colocalization of the molecules (Fig. 5⇑L). Therefore, the gpCD1b3 isoform might not have access to LAM molecules that are taken up by DC. These data demonstrate that individual isoforms, even within the same CD1b group, have distinct endosomal trafficking patterns that could facilitate broad surveillance of the intracellular environment for microbial Ags. During an infection, the DC become activated by microbial products through the stimulation of Toll-like receptors and other pattern recognition molecules. The DCs are highly phagocytic and take up Ags from the surrounding environment. Once activated, the DC increase the expression of MHC class I and II molecules leading to the presentation of Ag on the cell surface. DC also express high levels of CD1 Ag-presenting molecules and are probably involved in the initiation of CD1-restricted T cells responses in vivo. Therefore, we have begun to characterize these cells in the guinea pig, an important animal model for in vivo study of group 1 CD1 function. We used the in vivo administration of Flt-3LFc to increase the number of DC in guinea pigs. In these studies, we demonstrate that a murine Flt-3LFc reagent increases the number of DC in guinea pigs and thus facilitates the isolation of these cells from guinea pig tissues. Characterization of guinea pig DC demonstrates that these cells have a phenotype similar to DC from other mammalian species. Unfortunately, available Abs against cell surface proteins that are markers for mouse and human DC, such as CD11c and CD83, fail to cross-react with guinea pig cells (data not shown). However, the cell surface protein CD1 is highly expressed on DC in lymphoid (Fig. 1⇑) and nonlymphoid tissues in guinea pigs (11, 12). Therefore, we tracked the guinea pig DC through the isolation procedure by a combination of morphological criteria (dendritic morphology) and cell surface markers (CD1 and MHC class II). Consistent with the phenotype of human and mouse DC, guinea pig DC express both CD1 and MHC class II. Morphologically, isolated guinea pig DC exhibit fine cytoplasmic extensions (dendritic processes) when cultured ex vivo. Functionally, the DC support MLR responses and are capable of phagocytosis, also consistent with the DC phenotype. Thus, using both functional and morphological criteria, we have successfully isolated DC from guinea pigs that are comparable to those described from other mammalian species. Unlike humans that have single CD1b and CD1c isoforms, guinea pigs have an expanded set of the individual CD1b and CD1c isoforms. For example, guinea pigs have four members of the CD1b isoform group compared with the single CD1b isoform of humans. The individual gpCD1b isoforms have ∼80% homology between the individual CD1b isoforms (12). Interestingly, we noted previously that no homolog of the human CD1A gene was found among the gpCD1 genes identified thus far (12). However, examination of the predicted protein sequence revealed the absence of a tyrosine-based sorting motif on the C terminus of the gpCD1b3 protein while the other isoforms contained this motif (12). This is a hallmark of the mammalian CD1a protein which is the only group 1 CD1 isoform to lack a tyrosine motif in its cytoplasmic tail. The consensus tyrosine-based endosomal sorting motif used by CD1 proteins is YXXZ (where Y = tyrosine; X = any amino acid; Z = bulky hydrophobic). Such motifs have been shown previously to direct intracellular traffic through the interaction of a family of adapter protein complexes (32, 33). In contrast, the human CD1a isoform lacks this sorting motif and remains primarily surface-localized and traffics through early recycling endosomes (23). We previously proposed that gpCD1b3 might traffic in a manner similar to CD1a and thus fulfill the functional role of sampling the recycling endosomal compartment for lipid Ags (12). This observation was supported by immunofluorescence microscopy using a cell line transfected with gpCD1 genes (11). Confocal microscopy of the tissue-derived DC described in this study also showed surface staining of the gpCD1b3 isoform (Fig. 5⇑). In contrast, we found that in tissue-derived DC the gpCD1b1 isoform colocalized with MHC class II, possibly in late endosomes. Using LAM as a model CD1 lipid Ag, we demonstrated that traffic of this Ag to late endosomes prevented colocalization of the Ag with the gpCD1b3 isoform. These data indicate that the gpCD1b1 and gpCD1b3 isoforms localize to distinct cellular compartments which may, in turn, result in the presentation of different subsets of lipid molecules to CD1-restricted T cells. If indeed the guinea pig genome lacks a true homolog of CD1A, then it suggests that there may be strong evolutionary pressure in most mammalian species for a compensatory mechanism to sample lipid Ags from the recycling endosomal compartment. Sequence analysis clearly indicates that the gpCD1b3 isoform is a member of the CD1b isoform group although the trafficking pattern resembles that of the human CD1a isoform (11, 12). Thus, the guinea pig may have adapted one of the four gpCD1b isoforms to serve the same functional role as CD1a. Fine mapping of the YXXZ targeting motif has shown that substitution of the tyrosine (Y) residue is sufficient to prevent trafficking of the human CD1b protein to late endosomes (34). The gpCD1b1, -b2, and -b4 isoforms all use the TAT codon (Tyr) while the gpCD1b3 isoform has a TGT codon (Cys) at the same position. Thus, a single base change (A to G) at the second position of the tyrosine codon of an ancestral gpCD1B gene would result in a nonsynonymous mutation. This change could account for the predominantly cell surface location of the gpCD1b3 isoform. The capacity to broadly survey the endosomal system may be vital for effective immune responses to intracellular microbial infections that can occupy various subcellular compartments. Therefore, this may be an example of functionally convergent evolution in which a non-CD1a isoform has mutated to serve the functional role of sampling Ags from the early endosomal compartment. The guinea pig provides an alternative small animal model that has advantages over the mouse for certain infectious diseases. Vaccine testing for a range of human pathogens has been conducted using the guinea pig animal model. These include models of tuberculosis, anthrax, Ebola virus, and chlamydia where the mouse is either resistant to infection or exhibits a different pathology (35, 36, 37, 38). The characterization of DC in the guinea pig provides a unique opportunity to gain insight into the immunological capacity of this animal model. We thank Joel Ernst for supplying the GFP-expressing M. tuberculosis strain and Xin Xiao Zheng for providing the murine nonlytic IgG2a Fc fusion vector. We also thank Dr. Manuela Cernadas for critical review of the manuscript and Rodney Honeycutt for discussions regarding molecular evolution. ↵1 This work was supported by a grant from the Potts Foundation and from the National Institutes of Health (AI48932). S.M.B. was supported by the National Institutes of Health (AL64540) and by the Arthritis Foundation. S.A.P. is a recipient of the Burroughs Wellcome Fund Clinical Scientist Award in Translational Research, and received additional support from grants from the National Institutes of Health (AI45889 and AI48933) and the Irene Diamond Foundation. K.H. was supported by a fellowship from the Medical Foundation. ↵3 Abbreviations used in this paper: DC, dendritic cell; Flt-3, fms-like tyrosine kinase 3; Flt-3L, Flt-3 ligand; Flt-3LFc, Flt-3L mouse IgG2a Fc fusion protein; gpCD1, guinea pig CD1; LAM, lipoarabinomannan; GFP, green fluorescent protein. Nonacs, R., M. Witmer-Pack, and R. M. Steinman. 1992. Enrichment of dendritic cells by plastic adherence and EA resetting. In Current Protocols in Immunology, Vol. 1. J. E. Coligan, A. M. Kruisbeek, D. H. Margulies, E. M. Shevach, W. Strober, and R. Coico, eds. Wiley, Hoboken, NJ, p. 3.7.1. Lyman, S. D., E. Maraskovsky, H. J. McKenna. 1998. Flt3 ligand. A. W. Thomson, ed. The Cytokine Handbook 727 Academic, San Diego. Clark, G. J., D. Hart. 1998. Phenotypic characterization of dendritic cells. M. T. Lotze, and A. W. Thomson, eds. Dendritic Cells: Biology and Clinical Applications 555 Academic, San Diego. McMurray, D. N.. 1994. Guinea pig model of tuberculosis. B. R. Bloom, ed. Tuberculosis: Pathogenesis, Protection and Control 135 Am. Soc. Microbiol., Washington, DC.